This Situation Update describes events occurring in Bu Tho Township, Hpapun District in October and November 2014, including Tatmadaw activity, the Burma/Myanmar government’s situation, and land issues. 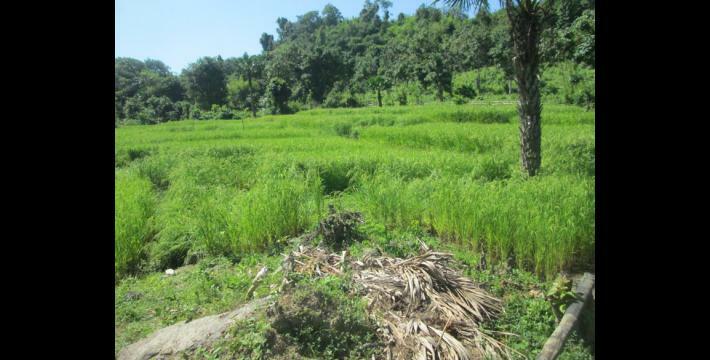 In October 2014, a Tatmadaw Operations Commander instituted a curfew in Whay Nhaung, Ku La Kaing and Mei That Lut Shan Kaing villages, threatening to kill those who disobeyed the order. Also in October, two soldiers from Tatmadaw Light Infantry Battalion (LIB) #340 threw still pinned hand grenades into crowded areas in order to scare local villagers preparing for Shan New Year. Land confiscation has caused issues for local people trying to earn a living. Some local people became unemployed as a result of their land being confiscated and now work as day labourers. The following Situation Update was received by KHRG in November 2014. It was written by a community member in Hpapun District who has been trained by KHRG to monitor local human rights conditions. It is presented below translated exactly as originally written, save for minor edits for clarity and security. This report was received along with other information from Hpapun District, including nine interviews, 87 photographs and two video clips. The activity of the Tatmadaw and Burma government in Bu Tho Township from October 10th to November 2nd 2014 is [included] in the information below. Tatmadaw LIB [Light Infantry Battalion] #340 is led by Saw Neh. He [Saw Neh] asked the Baw Hta village head and [local] teachers to come to him so that he could provide school support [for a Baw Hta village school]. When the village head and school teachers went to meet him he gave them three [Burmese language] magazines and took a picture with them. In October 2014, a Tatmadaw Operations Commander from [Strategic] Operations [Command] based in Hpapun Town created [rules] for Whay Nhaung village, Ku La Kaing village and Mei That Lut Shan Kaing village. [He said] that after 6:00 pm no one is allowed to walk around in the villages. If [the Operations Commander catches] villagers walking at night he will kill them with guns. He [Operations Commander] said that if he makes a mistake with the villagers he will get down on his knees to apologise. In October  on the full moon night, two soldiers from [Tatmadaw] LIB #340 drove a motorbike from A--- village to B--- village. Villagers were practicing dancing at 8:00 pm [in the villages] for the Shan New Year celebration because the time [new year] was coming soon for them. When they [were] practicing dancing [the] two soldiers came and threw two hand grenades [with pin intact] at the young people [practicing the dance]. The [dance] students were very shocked. In the month before October the Hpapun District administrator informed village heads [to announce to villagers] that no one is allowed to use hand grenades. Villagers do [not use hand grenades] but [these] two soldiers threw [a] hand grenade in B--- village and [then] came back and threw [one] in A--- village in C--- tea shop. The hand grenades did not explode [when they threw them]. In this case, villagers see these soldiers as provoking [the local people]. On October 10th 2014, the Tatmadaw, police, fire-fighters and village administrators [came together] to search cars. They searched them [each car] in front of Hpapun [Town] football ground. They checked them [each car] once because they [had] heard that the KNU [Karen National Union] would come and explode a hand grenade [in the region]. In section three of Hpapun [Town] the Burma government is establishing a library for villagers [so that they] will have the opportunity to read and will gain a lot of knowledge. 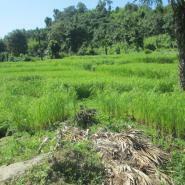 In Hpapun [Town], section three, the Burma government repaired and enlarged a road. 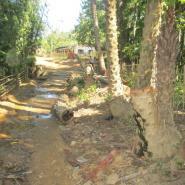 They [Burma/Myanmar government] cut down Saw D---’s palm trees and did not give him compensation. In Theh Kway area, which is located beside section three of Hpapun [Town], the Burma government intends to start a project. The purpose of the project is to set up a place [to live] for villagers who do not have land. If they [Burma/Myanmar government] really intend to establish [this project] it will include the land of villagers [in the Theh Kway area]. These villagers worry that they will not receive compensation [for their land]. In Hpapun District, the Burma [political] parties that are competing in the  election, such as the NLD [National League for Democracy], put up signboards in front of [political party] organisers’ houses. The Union Solidarity and Development Party (USDP) always display their signboard but now [that] the election is soon they put up three flags [as well]. Land confiscation occurred before the ceasefire, but since the ceasefire there has been no land confiscation in this area [Bu Tho Township]. 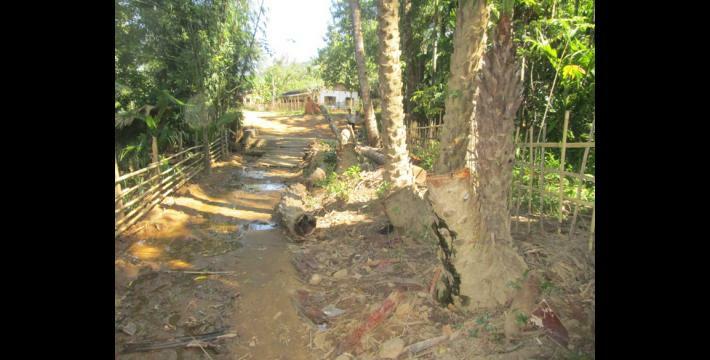 Land confiscation has brought problems for villagers who lost their land. They face difficulties earning a living. Some land owners have to work as [day] labourers because their land has been confiscated. There are many land owners [who lost their land and] have to do labour work. Some villagers submitted their land confiscation case in 2013 to [their district representatives in the national] parliament. For land owners to regain their land [in] land confiscation [cases], media groups have to pressure the Burma government. The local people are always living in fear and they cannot speak freely. They also do not know how to speak out [to leaders and concerned organisations]. They are not able to mobilise to protect [their land] and are not willing to do it [mobilise] anyway. [This situation update describes] Tatmadaw activity, Burma government projects and political party activity in the Bu Tho Township area. Strategic Operations Command (SOC) falls under regional command, with three to four battalions and a headquarters, covering an area mostly for defence. This particular SOC is composed of Infantry Battalion (IB) #19; Light Infantry Battalions (LIBs) #434, #431, and #340; and Ammunition Platoon #642. For further reading on these Battalions, see, for example: “Hpapun Situation Update: Bu Tho Township, February to June 2014,” KHRG, December 2014.